(Oromo Refugees in Aden) – Yemen seeking for international attention to the excessive discrimination made against us, in particular all the last two decades. The right delayed is the right denied. Who is behind and why is this all about? Is it sensible to think or say that such huge discrimination and inhuman treatment against the Oromo refugees, in particular is made out of the sight of or, does the international community including the relevant law intends to discriminate against the Oromo refugees? And what will the outcome or effects of the closed eyes (of the governments, human rights etc) to the abuses facing the Oromo refugees in Yemen be on future of the human rights? Despite the prevailing situation is serious in general and probable to deteriorate our situation from bad to worse or to expose us more to the dangers anticipated/ intended, but it is not seemed however to be much different from the war of the excessive discriminations inflicted on us, in particular since more than 17 years as refugees in Yemen. As Oromo refugees we were under constant threats, intimidation, systematical discrimination and deprivation of the rights as refugees and, or the right to seek /claim against or for fair protection and treatment as equal as the other refugees in Yemen. Threats: harassment and extortion the Oromo refugees with UNHCR mandates (in the streets, at their work places and even, in their home etc) by the police just for they are” Oromo refugees” that compelled the Oromo to hide under the pretense of Somalis on need (during movement out of the living area etc). Intimidation: frightening the Oromo refugees by threatening situation or forcibly deportation for claiming for the right to protection, equal treatment to other refugees, Or for claiming against the abuses. Systematical discrimination: whenever we seek for the right to (protection, education, etc), the response for this by UNHCR (national staffs) in Aden is to say that we are not allowed to have or to seek for these rights in Yemen because the authority doesn’t recognize or that it does consider the Oromo refugees as illegal. We are honest that we should respect the irregular policy of the Yemeni government towards us because it has been clear to be unwilling to grant the Oromo refugees as others. But we are seriously pointing to UNHCR which fails a pinnacle of its obligation towards us by procrastination with our refugee protection. Oromo refugees particularly, in Aden are trapped in the moist of systematical pressures and deprivation by UNHCR , which was and still having political outlook towards us and practicing very scathing criticism( as to blame us as though we behave to contravene against the law etc) and misinformation against us excessively as a pretext to disprove or deny as well as to blur the international attention towards the well-founded and flagrant threats facing the Oromo refugees, in particular in Yemen. Whatever we seek or claim for (e.g. Refugee protection, assistance, the rights etc as refugees) is distorted as being for resettlement (: as if our entire claim intends for resettlement) even though it is for specific assistance. On the contrary, UNHCR is giving resettlement in third countries just for better change, for non-Oromo refugees those are granted all the rights as equal as the host community. Sometimes UNHCR claims that they are treating the Oromo refugees as same as the others by offering them assistance needed including resettlement. And at the same time they contradict what they’ve already mentioned by saying that ‘our refugee status has been deaden for belonging to the (OLF), which has lost its political legitimacy in the world. But they are still unable to respond to the question says “ how could the Oromo Refugees in Aden – Yemen seeking for international attention to the excessive discrimination made against us, in particular all the last two decades. The right delayed is the right denied. failure of the” OLF” policy in the world effect on only the refugees in Yemen apart from those in other countries of asylum”? We are under influence of the national staffs who struggle hard to hide and confuse the actual facts related to our prolonged sufferings. UNHCR expatriate doesn’t perceive severity / situation facing us, because we are denied the right to access to persons of concern, and any written letter is interceded by the staffs intend to fail our reasonable claim before reaching the person of concern. So, they use to deter and eliminate us even, our committee leaders by their guards or the police. The staffs just then give the expats distorted information and persuade them wrongly about our intention. What kind of the humanity is this, of which the deserving people are deprived while offered for those who should be considered as secondary concern? In spite of such flagrant abuses, unkind treatment and discrimination treated against Oromo refugees, but the international community uses to turn a blind eye towards us by relying on the distorted information given by its customers (UNHCR) concern problems of the Oromo refugees. All this discrimination is made to us because we are defenseless and without advocate, although the situation necessitates because the general attention to the refugee protection has become less and complicated unless international advocacy is made on behalf of these refugees according to the relevant laws. But the silence of the international community, Human Rights watch etc towards these inhuman treatments against the Oromo in particular has discouraged humanity and courage much more the abusive policy of the Ethiopian government against Oromo in Yemen. UNHCR has played very crucial role in getting the Oromo refugees deprived of not only the rights as refugee in Yemen, but also of humanitarian intervention endeavored by some government interests and supports humanity such as( the government of Canada, which made great attempts two consecutive years [ 2004, 2005 ] willingly intending to give the Oromo refugees citizenship. But UNHCR in Aden denied the two times missions preventing them even, from visiting location of the Oromo refugees. However, we never forget the praiseworthy attempts intended by government of Canada. The prolonged deprivation or discrimination treated against us has now been affecting our children those were born under the flag of UNHCR in Yemen. If the law itself discriminates against the parents, isn’t there any of the laws which support the right of the children? This is not for the first time but we wrote a lot of petition to you since 2004 but never brought any positive change. Instead, we have been made to face worse and badly overreacted pressures resulted from the petitions applied, because no intervention or attention has been made towards us, excepting the amnesty’s very humanitarian Endeavour which should never be forgotten. But UNHCR blocked the process before reaching destination. Comment on the Oromo communities in (the global continents) On behalf of the Oromo refugees living under appalling condition in Yemen, we would like to mention fraternal regards to all the Oromo communities in the world and we hope for you great success in your efforts aiming for the Oromo problems inside and outside of Oromia in general and for the Oromo Refugees in Aden – Yemen seeking for international attention to the excessive discrimination made against us, in particular all the last two decades. The right delayed is the right denied. Refugees those have threatened by the abusive policies emanating from the despotic government of Ethiopia in countries of asylum. As we believe Oromo has lots of intellectuals in many countries in the word but we are disappointed and surprising about their silence on the sufferings of their people (refugees). What is the main role they have played in bringing a possible solution for their threatened refugees particularly, those in the Arab countries although a massive petition to you has been applied? We hope this time should not be as before. You are aware of what is going on in Yemen that has compelled the international community to take its peoples from Yemen. Refugees (Somalis) have been leaving and others even, the Eritrean refugees have been promised by the Ethiopian authority to be taken from Yemen. 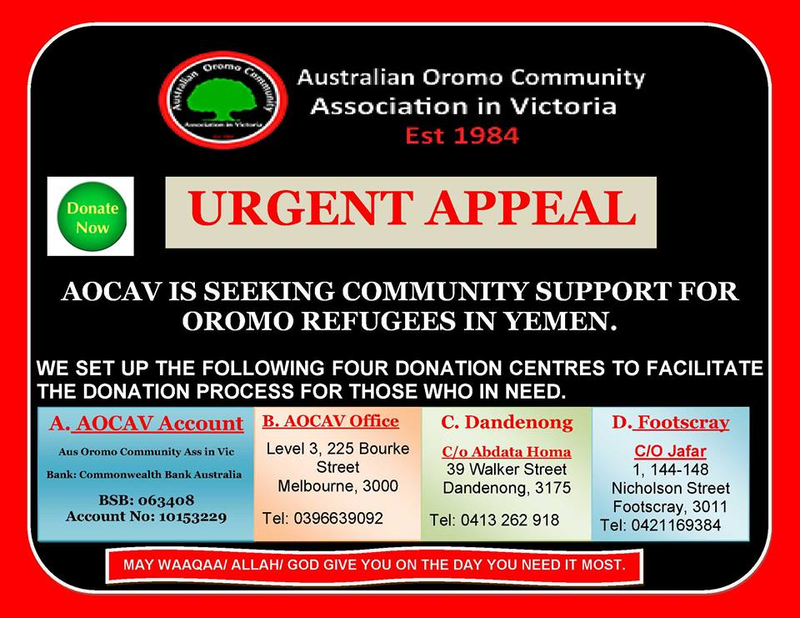 But what about the Oromo refugees who have nowhere to return although Oromo is the most vulnerable, the most threatened refugee in Yemen? UNHCR in Aden also has left us heedlessly and without even, a piece of advice concern the dangers surrounding despite we are the most liable refugees to any possible threats on the ground more than any others. Effects expected from this deterioration towards us: Oromo refugees in Yemen are beset by Ethiopian abusive policy through the Saudi which is striking on Yemen. As we know the last aggressive deportation process made against thousands of Ethiopian from Saudi Arabia was carried out by the request from the Ethiopian authority through its friendly relationship with kingdom of Saudi. And now it is controlling completely all over Yemen and it is intending to deploy its forces that can be very harmful to us in Yemen. 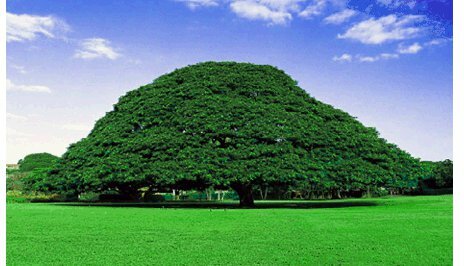 It is believable that Saudi will carry out forcibly deportation against us on the request of Ethiopia. In addition there is rumor information that some political faction in Yemen uses to recruit and exploit peoples (refugees) in struggling. And this can make us target to any possible revenge. As remembered last year on 7 March 2014 Ethiopian authority came to our settled area called Basateen with Yemeni authority to make plane how to deport Ethiopian refugees In Aden/ Yemen. The other side is the Ethiopian government is planning and made agreement with Djibouti government to deport Oromo refugees in Yemen by sea if by the plane is impossible, as we hearing information and we seen in this month they taken 30 Ethiopian embassy community from Aden to Ethiopia by the sea. Therefore, we are writing this urgent appeal letter to international community( US government, human rights organizations and others) seeking your urgent attention and assistance to get us rid of this threatening situation as soon as possible. Finally, we would like to insist you( the Oromo communities and representatives wherever they are) to give a good support to this petition and enable it reach to all peoples of concern and governments possible to give us lasting solution as humanitarian. Oromo Refugees in Yemen Civil War Are Trapped and Pleading for Help — Listen This Short Interview Would Give You Good Picture of Their Situation.